1. the joint between the leg and foot. 2. the area around this joint (see illustration). The ankle is a hinge joint formed by the junction of the tibia and fibula with the talus (ankle bone). The bones are cushioned by cartilage and connected by a number of ligaments, tendons, and muscles that strengthen the joint and enable it to be moved. Because it is in almost constant use, the ankle is particularly susceptible to injuries, such as sprain and fracture. It is also often one of the first joints to be affected by arthritis or gout. ankle cuff a weighted strip wrapped around the ankle and closed with a Velcro band; used during exercise. 2. The region of the ankle joint. 2. the region of this joint. 1. The joint formed by the articulation of the lower leg bones with the talus. The ankle connects the foot with the leg. 2. The slender section of the leg immediately above the foot. 1 the joint of the tibia and fibula of the leg with the talus of the foot. 2 the part of the lower limb where this joint is located. The joint between the lower ends of the TIBIA and FIBULA and the upper surface of the talus bone of the foot. 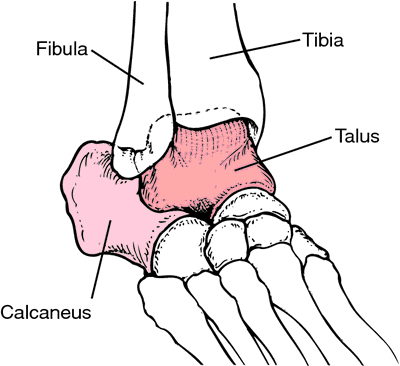 The talus sits on top of the heel bone (calcaneum). n 1. anatomical area (joint) just above the foot. 2. in craniosacral therapy, one of two places on the body where the caregiver lays both hands and determines the vitality and bounty of cerebrospinal fluid. See also listening posts. a human anatomical term often applied to dogs when referring to the hock joint. Q. What Causes ankle Swelling? My son woke up this morning with a red, swollen ankle. What could cause this situation? A. A swollen and red ankle suggest either a traumatic injury to the joint or an infection in the joint, adjacent tissues or bones. This is an emergency and it is important to consult a doctor as soon as possible, especially if the joint loses its ability to perform movements in all directions. Surgical solutions company DT MedTech LLC (DTM) reported on Wednesday the receipt of 510(k) clearance from the US Food and Drug Administration (FDA) for its Hintermann Series H2 Total Ankle Replacement System for use with bone cement to treat ankle arthritis in either primary or revision surgery of damaged ankle joints. Concern regarding the use of ankle MRI studies prompted fellowship-trained foot and ankle surgeons at our institution to hypothesize that ankle MRI was overused in the military setting, and inspired a process improvement initiative. Nguyen accomplished PMSR/RRA - forefoot/rearfoot/ankle certification from the American Board of Foot & Ankle Surgery during his three year study at the Thomas Jefferson University in Morristown, New Jersey. Examination of his left ankle revealed tenderness over the anterior aspect at the tibiotalar joint. Chronic ankle instability (CAI) is a subjectively reported phenomenon that has been defined as a tendency for the ankle to give way during normal or sports activities (Monaghan et al. Objective: Acute ankle sprains are one of the most common injuries in emergency departments. As I was growing up, I repeatedly sprained my left ankle. Any of these injuries can cause instability in your ankle, increasing your risk of re-injury and setting the stage for pain and ankle arthritis later on. Although ankle sprains and strains frequently occur while engaging in sports or exercise classes, they also can happen if you step off a curb, into a pothole, or onto uneven ground. THE foot and ankle is a very complex mechanism, comprising nearly 30 small bones. When humans walk on a straight path, turn, or step on an object, the ankle rotates in all possible directions.